Current UBC Vancouver grad student? Win the next GSS Award! September 14th, 2015 by cIRcle staff | Comments Off on Current UBC Vancouver grad student? Win the next GSS Award! 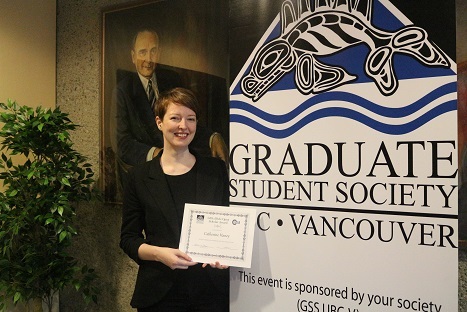 Posted in award, Blog, cIRcle, Graduate Student Society (GSS), Graduate students, GSS cIRcle Open Scholar Award, News, Open Access, research discovery, scholarly communications, UBC Library, University of British Columbia (UBC) | Comments Off on Current UBC Vancouver grad student? Win the next GSS Award! FOR IMMEDIATE RELEASE: June 9, 2015: IBBY Canada, the Canadian national section of the International Board on Books for Young People, is pleased to announce that the Claude Aubry Award for distinguished service in the field of children’s literature will be presented to Judith Saltman and Jacques Payette. Both winners will receive their awards in conjunction with a special event for children’s literature in the coming year. Judith Saltman is the recipient of the Claude Aubry Award for distinguished service in the field of children’s literature in English. Ms. Saltman is a Professor at the School of Library, Archival & Information Studies, and Chair of the Master of Arts in Children’s Literature Program at the University of British Columbia. With Gail Edwards, she authored Picturing Canada: A History of Canadian Children’s Illustrated Books and Publishing. Her research includes literature for children and young adults, publishing for children in Canada, and public library services for children and young adults. Jacques Payette is the recipient of the Claude Aubry Award for distinguished service in the field of children’s literature in French. Mr. Payette is a pioneer in the publishing and the editing of children’s books and magazines in Quebec. Since 1968 he has been the owner of Éditions Heritage, which now lists over 2000 titles, and in 1997 founded the publishing house Dominque et compagnie. Toupi and Binou, Alice, Caillou, and Galette—characters well known to children today—are among the many creations he has published. The Claude Aubry Award jury was comprised of Lisa Doucet (Woozles Bookstore, Halifax), Annabelle Foster (Saskatoon Youth Librarian), France Lapierre (retired MELS Quebec), and Susane Duchesne (Librairie Monet, Montreal Youth Literature Bookseller). The Claude Aubry Award was established in 1981 in honour of the late author, translator, and director of the Ottawa Public Library. IBBY Canada presents two Aubry Awards biennially, from nominations of individuals who have made a significant contribution to Canadian children’s literature. Eligible nominees include authors, publishers, illustrators, translators, designers, editors, librarians, booksellers, and teachers. Previous recipients include Patsy Aldana, Marie-Louise Gay, Andrea Deakin, Chantal Vaillancourt, Dave Jenkinson, Charlotte Guérette, Peter Carver, Catherine Mitchell, Bertrand Gauthier, Michael Solomon, Ron Jobe, Virginia Davis, Judy Sarick, May Cutler and Sheila Egoff. IBBY, the International Board on Books for Young People (www.ibby.org), founded in 1953, represents an international network of people committed to bringing books and children together. IBBY Canada, a volunteer organization formed in 1980 to promote Canadian children’s literature, is one of over 70 IBBY national sections worldwide, and. IBBY Canada members include authors, illustrators, librarians, booksellers, educators, and publishers. For more information about IBBY and the Claude Aubry Award, please visit www.ibby-canada.